U.S. pianist Van Cliburn, who won the 1st Prize in piano at the First P.I. 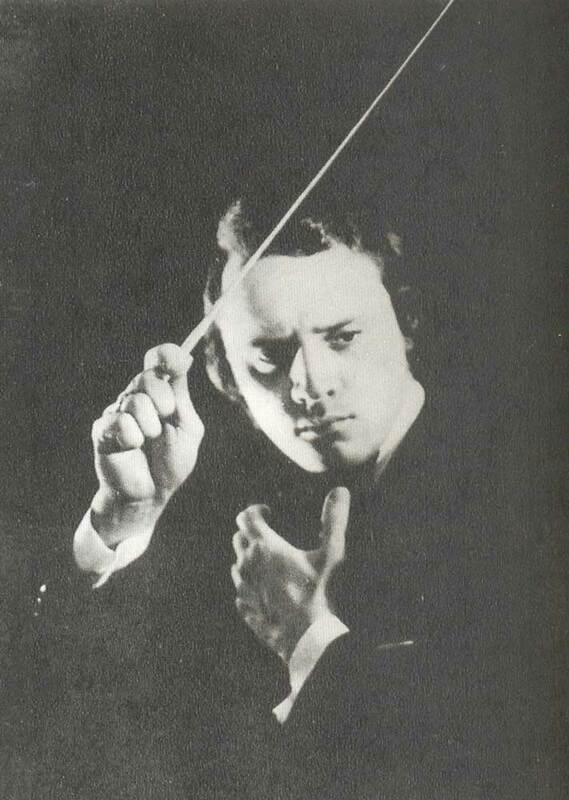 Tchaikovsky Competition, and Kirill Petrovich Kondrashin (1914-1981), chief conductor of the Moscow State Phiharmony, a pedagogue of the Conservatoire (1951-1954). People`s Artist of the USSR, Laureate of the USSR and RSFSR State Prizes. In the Grant Hall of the Conservatoire. 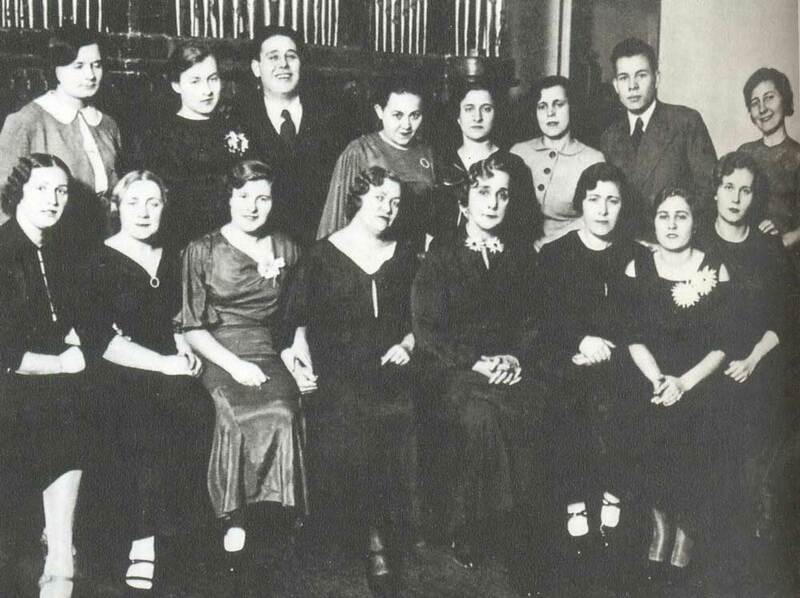 In the Grant Hall of the Conservatoire during the First International P.I. Tchaikovsky Competition of Perfopmers-Musicians in Moscow (1958). In front of the Conservatoire. In front of the Conservatoire during the Competition. Rector A.V. 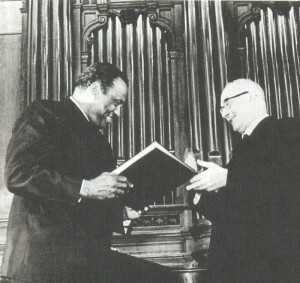 Sveshnikov and singer Poul Robeson. Rector A.V. 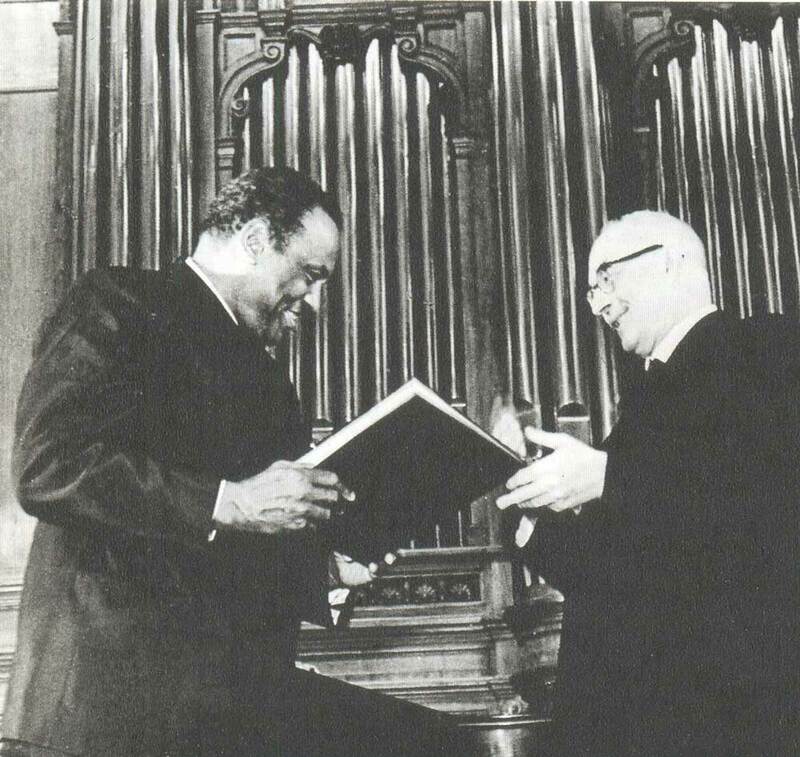 Sveshnikov, presenting an Honorary Diploma of Professorship at the Conservatoire to U.S. singer Poul Robeson (1957). Rector A.V. 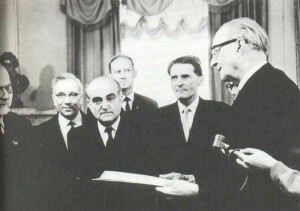 Sveshnikov, presenting an Honorary Diploma of Professorship at the Conservatoire to Hungarian composer Zoltan Kodaly (first from left) (1963). Vladimir Ivanovich Fedoseyev, pupil of L.M. 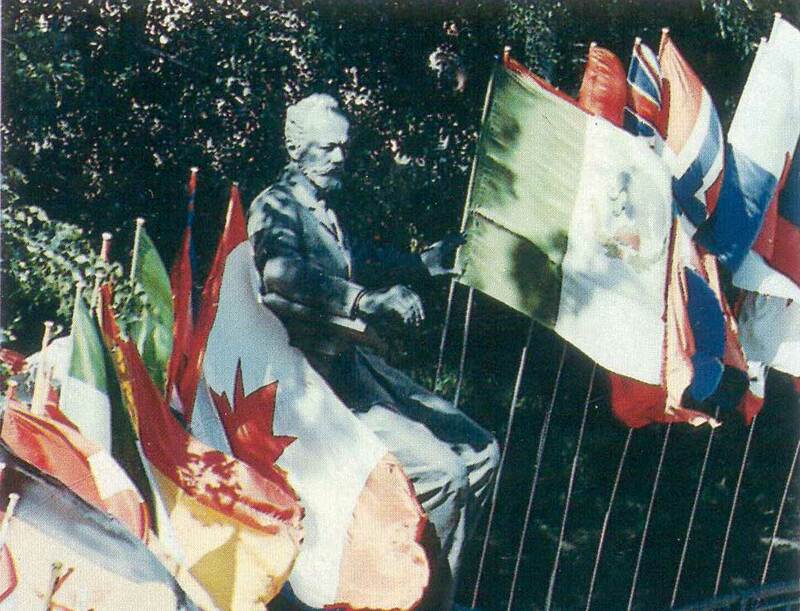 Ginzburg, People`s Artist of the USSR. 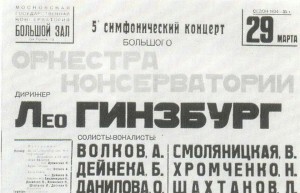 Laureate of the USSR and RSFSR State Prizes. Alexander Nickolayevich Lazarev, pupil of L.M. 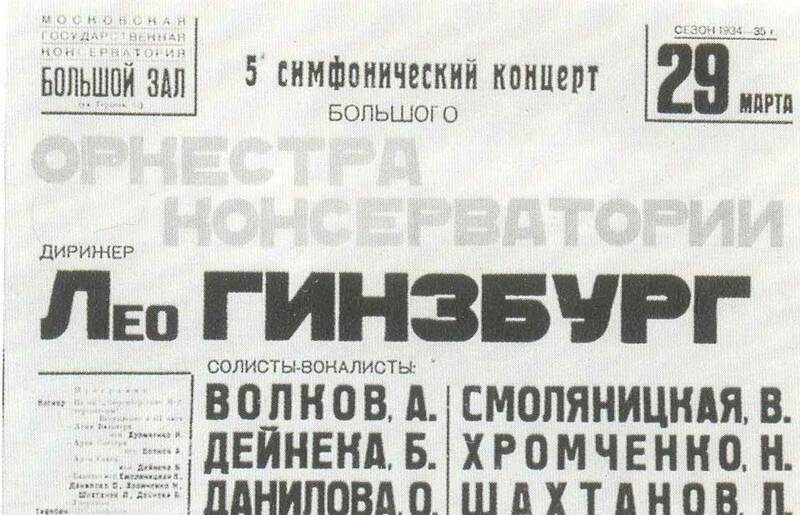 Ginzburg, People`s Artist of the USSR. 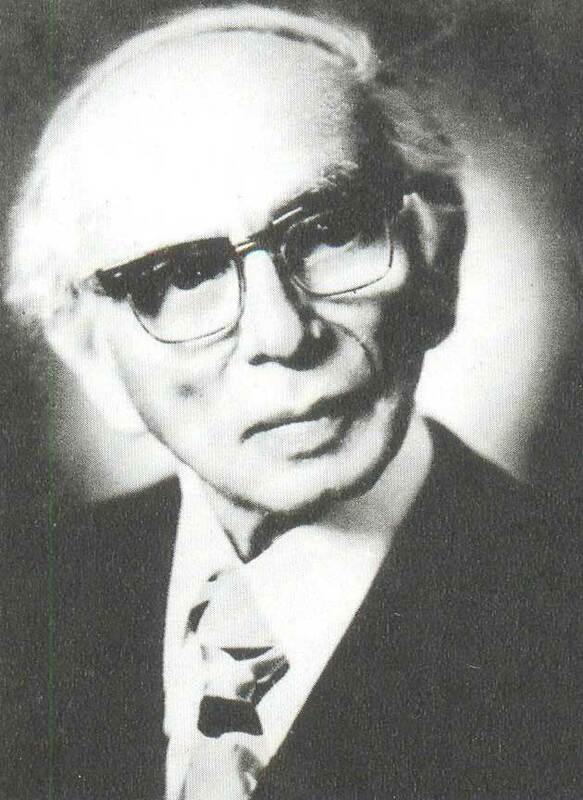 Leo Moritzevich Ginzburg (1901-1979), conductor, pianist. Teacher of conducting (1930-1943, 1948-1979, since 1939 – professor). Merited Art Worker of the RSFSR. 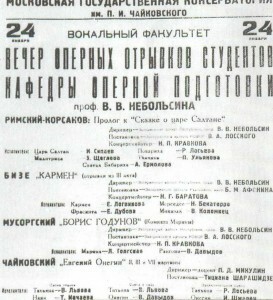 Poster announcing the concert of the Conservatoire Symphony Orchestra conducted by L.M. Ginzburg (1935). Nickolai Pavlovich Anosov (1900-1962), conductor. 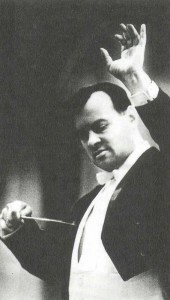 Nickolai Pavlovich Anosov (1900-1962), conductor. Teacher of conducting (1940-1962, since 1951 – professor). Merited Art Worker of the RSFSR. Together with his pupils. S. Tsitsyn, P. Yakovenko, concertmasters M.G. Kharlap and L.D. 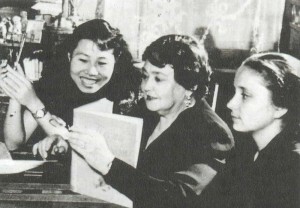 Tikhonova, T. Osmanov and Lee Delun (1956). Yevgeny Fyodorovich Svetlanov, pupil of A.V. 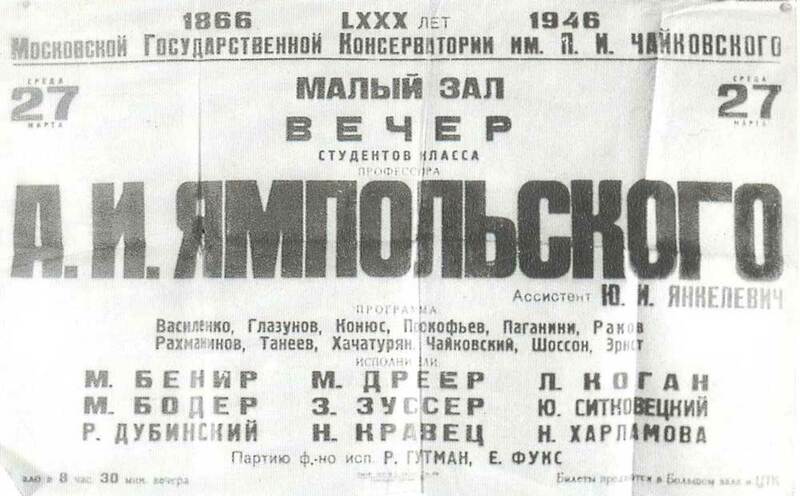 Gauk, People`s Artist of the USSR, Hero of Socialist Labour, Laureate of the Lenin and State Prizes. Alexandr Vassilyevich Gauk (1893-1963). conductor, composer. Alexandr Vassilyevich Gauk (1893-1963). 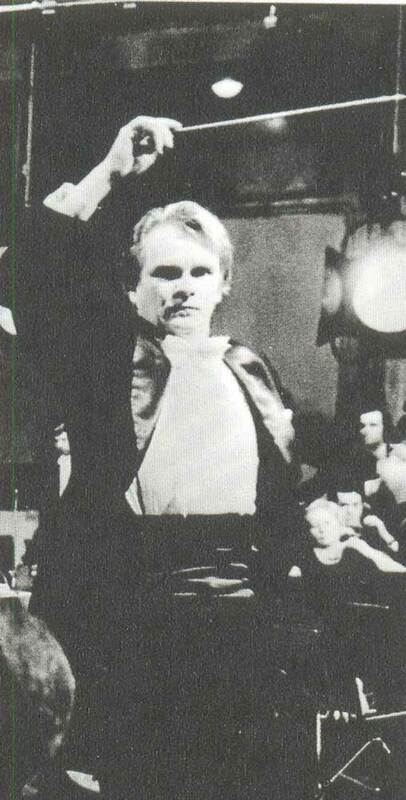 conductor, composer. Teacher of conducting (1939-1963, since 1948 – professor). People`s Artist of the RSFSR. 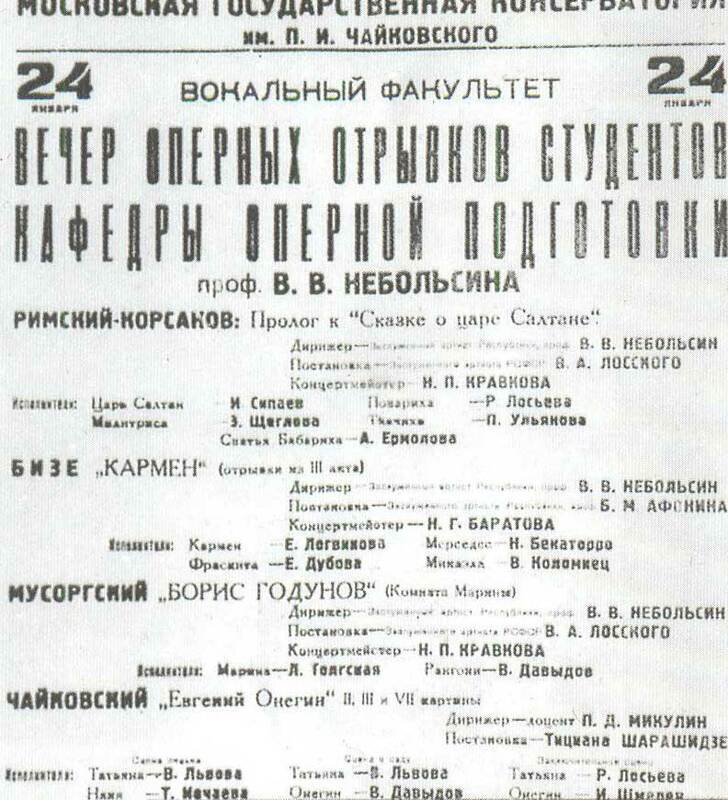 Poster announcing the concert of V.V. Nebolsin`s Chair of Operatic Training to be held in the Grand Hall of the Conservatoire (1958). 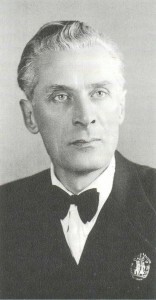 Vassily Vassilyevich Nebolsin (1898-1958), conductor, composer. Vassily Vassilyevich Nebolsin (1898-1958), conductor, composer. 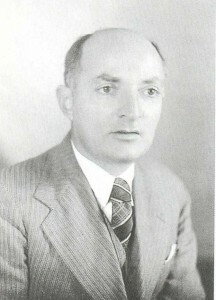 Professor of conducting (1940-1945). Hinoured Artist of the RSFSR, Laureate of the USSR State Prize. 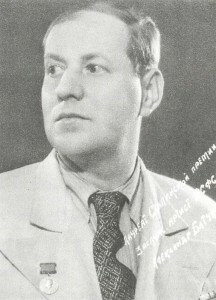 Alexandr Josifovich Baturin (1904-1983), singer. Alexandr Josifovich Baturin (1904-1983), singer. Teacher of solo singing (1948-1983, since 1962 – professor). People`s Artist of the RSFSR, Laureate of the USSR State Prize. 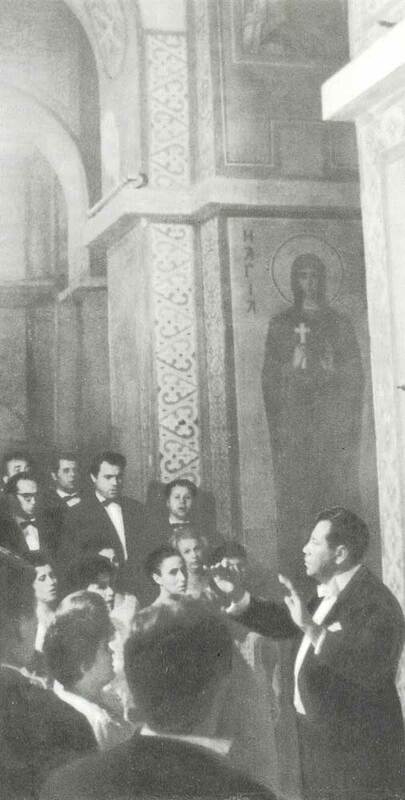 Gugo Ionatanovich Titz (1910-1986), singer. 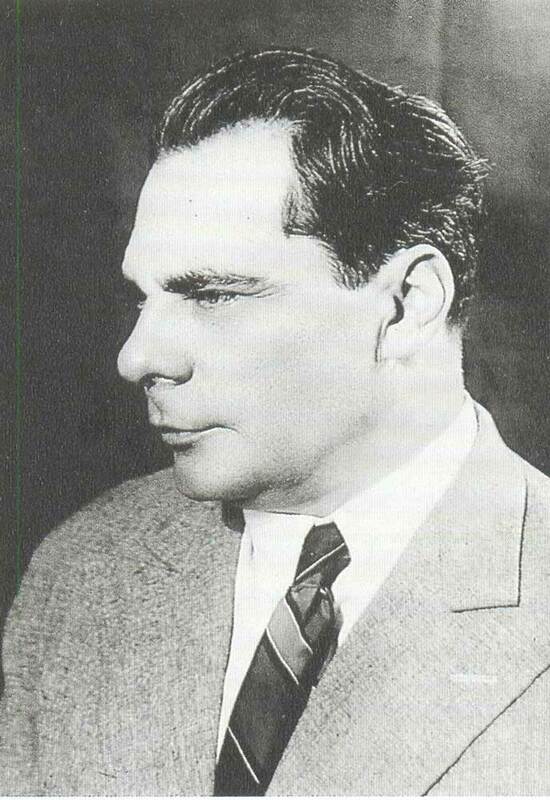 Gugo Ionatanovich Titz (1910-1986), singer. 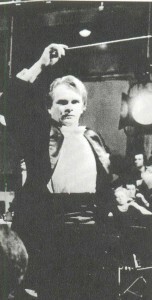 Teacher of solo singing (1945-1986, since 1967 – professor). Anatoly Leonidovich Dolivo-Sobotnitsky (1893-1965), singer. 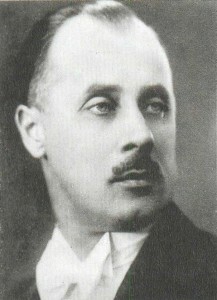 Anatoly Leonidovich Dolivo-Sobotnitsky (1893-1965), singer. Teacher of solo and chamber singing (1930-1965, since 1932 – professor). Merited Art Worker of the RSFSR. 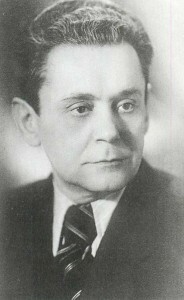 Sergei Yakovlevich Lemeshev (1902-1977), singer. 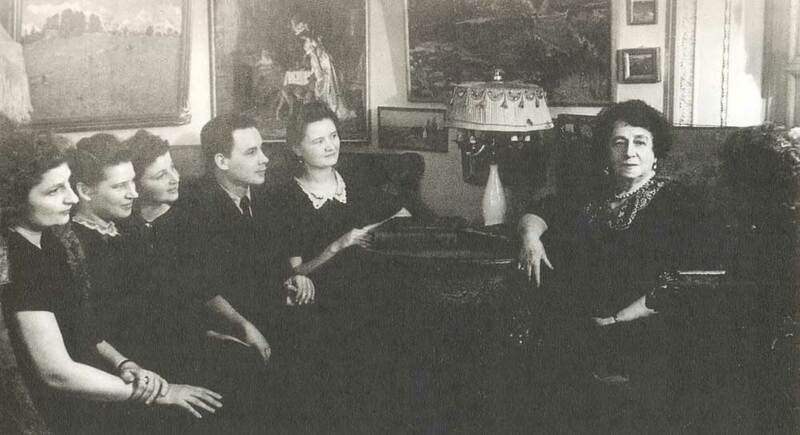 Artist director of the opera studio (1959-1961). People`s Artist of the USSR, Laureate of the USSR State Prize. 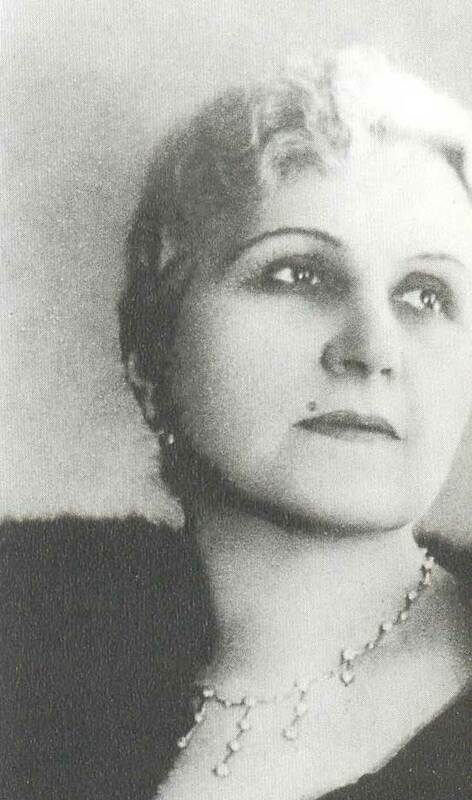 Valeria Vladimirovna Barsova (1892-1967), singer. Valeria Vladimirovna Barsova (1892-1967), singer. Teacher of solo singing (1950-1953, since 1952 – professor). People`s Artist of the USSR, Laureate of the USSR State Prize. Sergei Ivanovich Migai (1888-1959), singer. 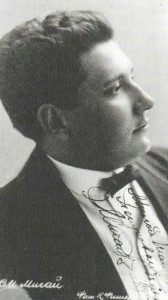 Sergei Ivanovich Migai (1888-1959), singer. Teacher of solo singing (1948-1959, since 1952 – professor). People`s Artist of the RSFSR. 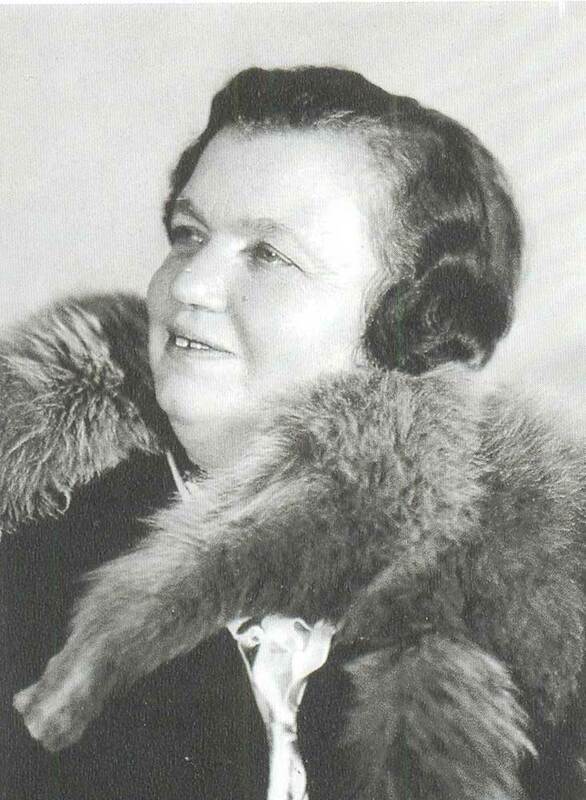 Yelena Klimentyevna Katulskaya (1888-1966), singer. 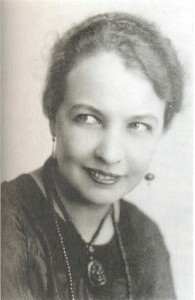 Yelena Klimentyevna Katulskaya (1888-1966), singer. Teacher of solo singing (1948-1966, since 1950- professor). People`s Artist of the USSR, Laureate of the USSR State Prizes. With her pupils Tamara Andreevna Milashkina (right) and Go-Shutsen, winners of international competitions. 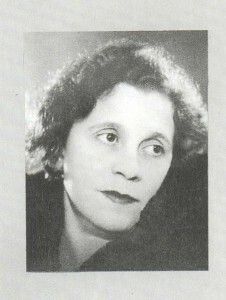 Faina Sergeevna Petrova (1890-1975), singer, pianist. Teacher of solo singing (1926-1928, 1945-1975, since 1945 – professor). Honoured Artist of the RSFSR. Xenia Georgievna Drzhinskaya (1889-1951), singer. Professor of solo singing (1947-1951). People`s Artist of the USSR State Prize. Yelizaveta Fyodorovna Petrenko (1880-1951), singer. Yelizaveta Fyodorovna Petrenko (1880-1951), singer. Teacher of solo singing (1929-1950, since 1935 – professor). Merited Art Worker of the RSFSR. Xelena Nickolayevna Dorliac (1882-1945), singer. Professor of solo and chamber singing (1930-1945), head of the opera studio (1933-1934), artistic director of the opera studio (1944-1945). Merited Art Worker of the RSFSR. Maria Vladimirovna Vladimirova (1879-1945), singer. Teacher of solo siting (1925-1956, since 1939 – professor). Merited Art Worker of the RSFSR. Antonina Vassilyevna Nezhdanova (1873-1950), singer. Antonina Vassilyevna Nezhdanova (1873-1950), singer. Professor of solo singing (1943-1950). People`s Artist of the USSR, Laureate of the USSR State Prize. Together with her pupils. Alexandr Alexandrovich Yurlov (1927-1973), pupil of A.V. Sveshnikov, choral conductor, music figure, People`s Artist of the RSFSR. 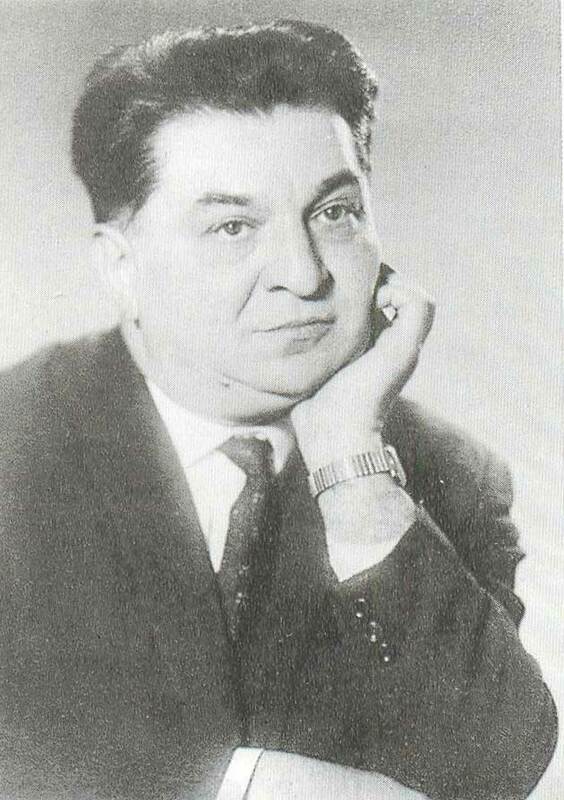 Klavdy Borisovich Ptitsa (1911-1983), choral conductor. Teacher of choral conducting (1938-1941, 1943-1983, since 1956 – professor). People`s Artist of the USSR. Alexandr Vassilyevich Sveshnikov (1889-1980), choral conductor, music figure. 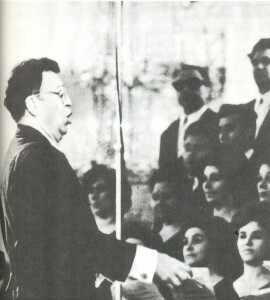 Teacher of choral conducting (1944-1974, sicne 1946 – professor), rector (1948-1974). People`s Artist of the USSR, Hero of Socialist Labour, Laureate of the Lenin and State Prizes. Nickolai Nikonorovich Soloduyev (1890-1971), oboist. 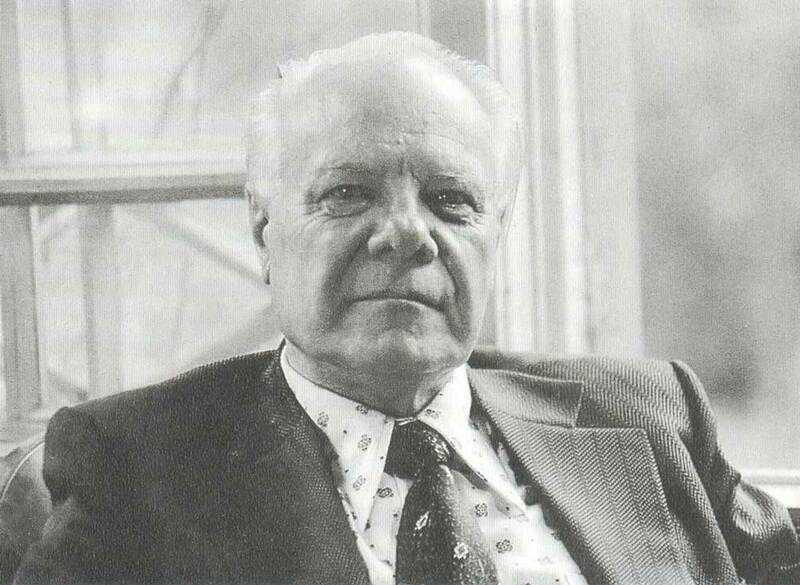 Teacher of oboe (1935-1971, since 1943 – professor). Merited Art Worker of the RSFSR. Georgy Antonovich Orvid (1904-1980), trumpeter, music figure. Teacher of trumpet (1931-1980, since 1941 – professor), deputy director for scientific and educational work (1948-1954). People`s Artist of the RSFSR. Mikhail Innokentyevich Tabakov (1877-1956), trumpeter. Teacher of trumpet (1919-1949, since 1923 – professor). Merited Art Worker of RSFSR. 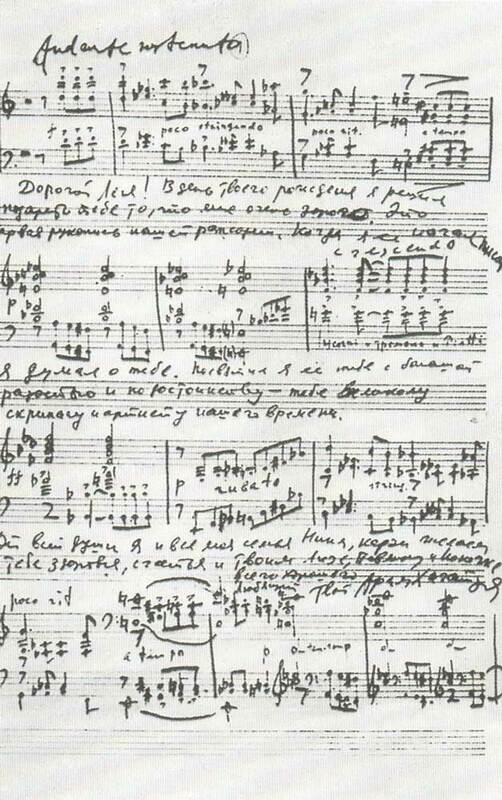 With his pupil Timofei Alexandrovich Dokschizer, who graduated from the Moscow Conservatoire also in L.M. Ginzburg`s class of symphonic conducting. 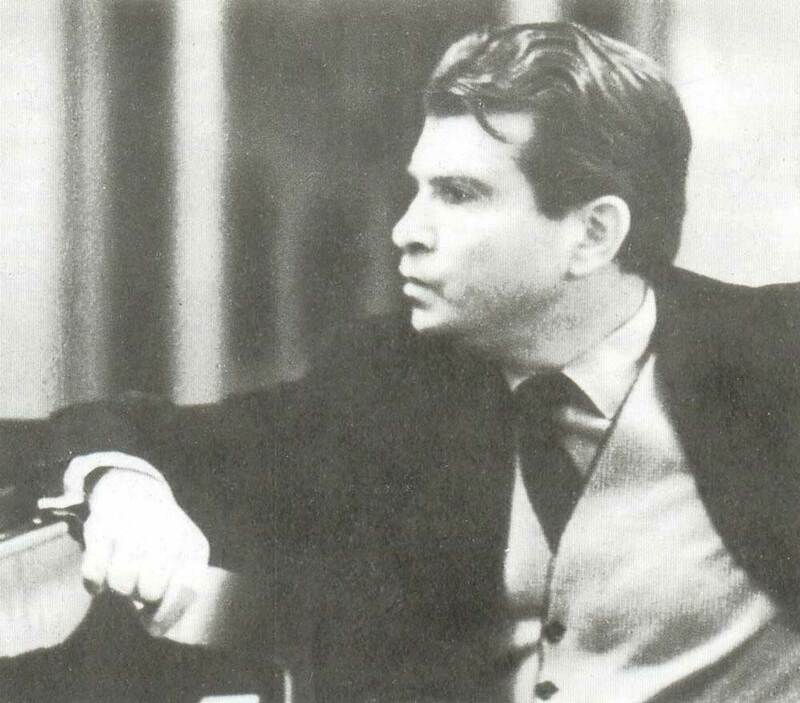 Mstslav Leopoldovich Rostropovch, cellist, conductor. Teacher of cello (1948-1974, since 1960- professor). People`s Artist of the USSR, Laureate of the Lenin and State Prizes. Together with his pupils in the class-room. 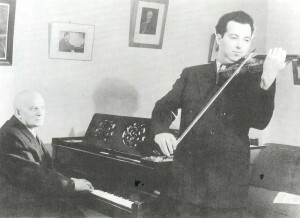 Svyatoslav Nickolayevich Knushevitsky (1907-1963), cellist. 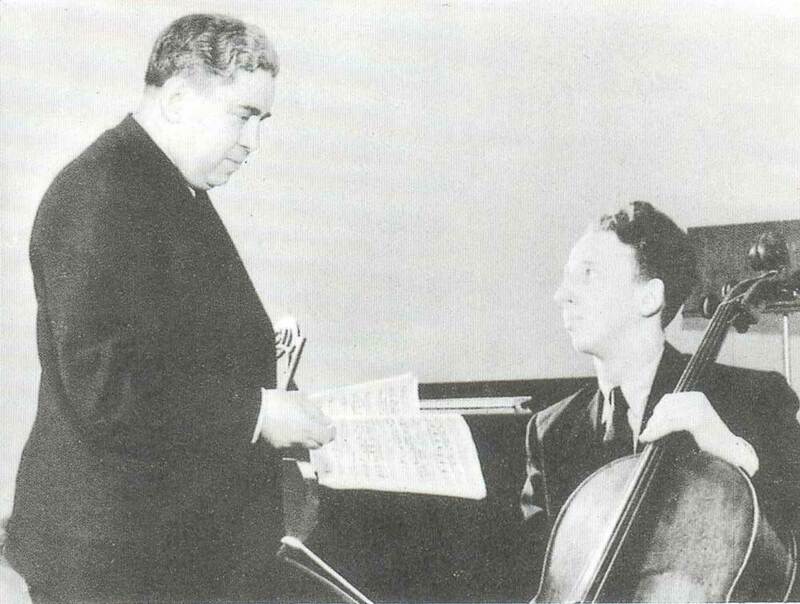 Teacher of cello (1941-1963, since 1950 – professor). Merited Artist of the RSFSR. 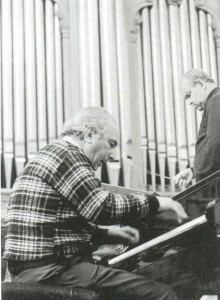 At the lesson with his pupil Mikhail Emmanuilovich Homitzer, winner of international competitions. 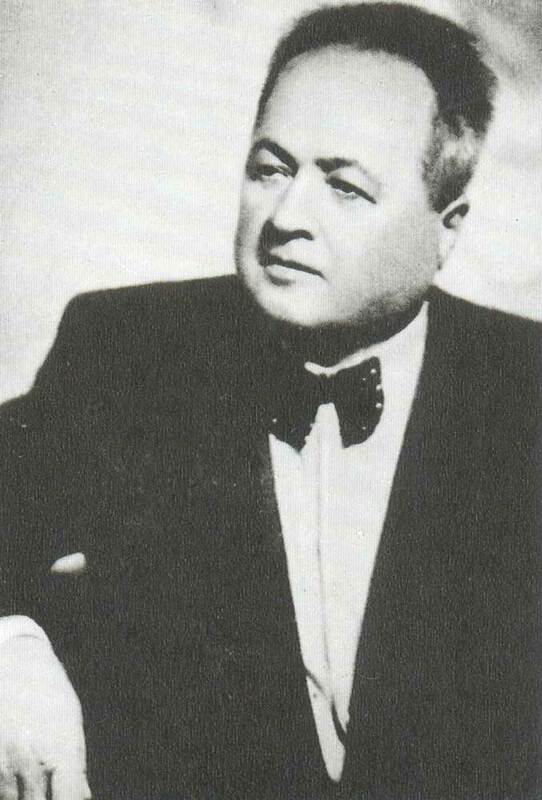 Semyon Matveevich Kozolupov (1884-1961), cellist. Professors of cello (1922-1961). People`s Artist of the RSFSR. Mark Iljich Yampolsky (1879-1951), cellist. Professor of cello (1930-1951). 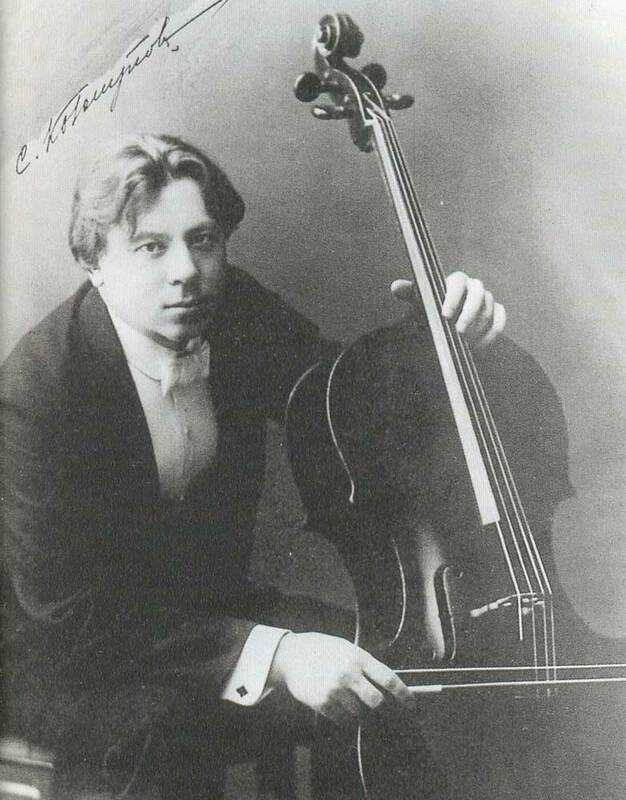 Mark Iljich Yampolsky (1879-1951), cellist. Professor of cello (1930-1951). Together with his pupils (the 1940s). 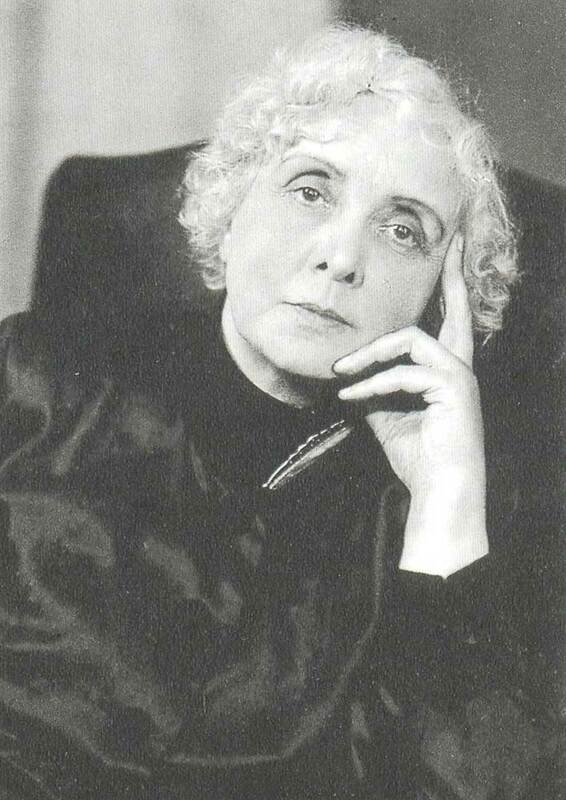 Liana Alexandrovna Isakadze, pupil of D.F. Oistrakh, winner of international competitions. 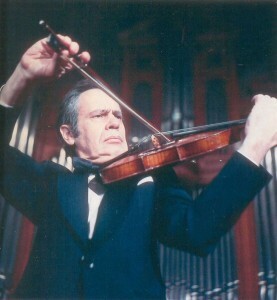 David Fyodorovich Oistrakh (1908-1974), violinist. Teacher of violin (1934-1974, since 1939 – professor). People`s Artist of the USSR, Laureate of the Lenin and State Prizes. 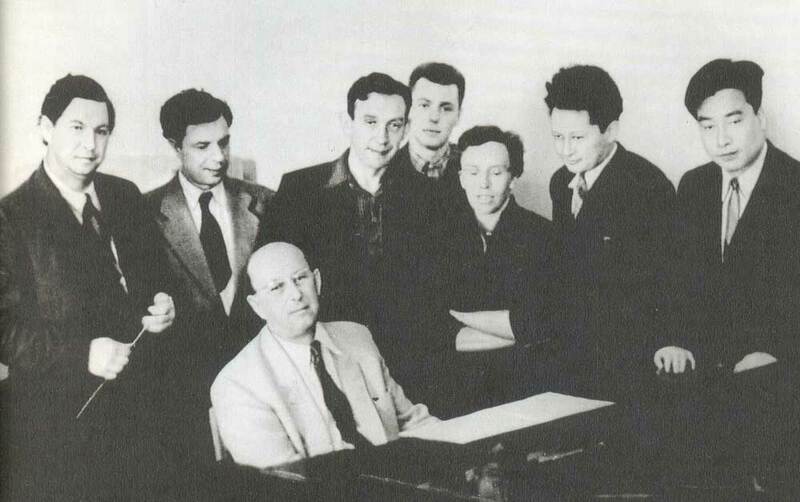 Together with his pupils: Valery Alexandrovich Klimov, Eduard Davidovich Grach, Igor Davidovich Oistrakh, winners of international competitions. Victor Victorovich Tretyakov, pupil of Yu.I. Yankelevich, winner of international competitions. 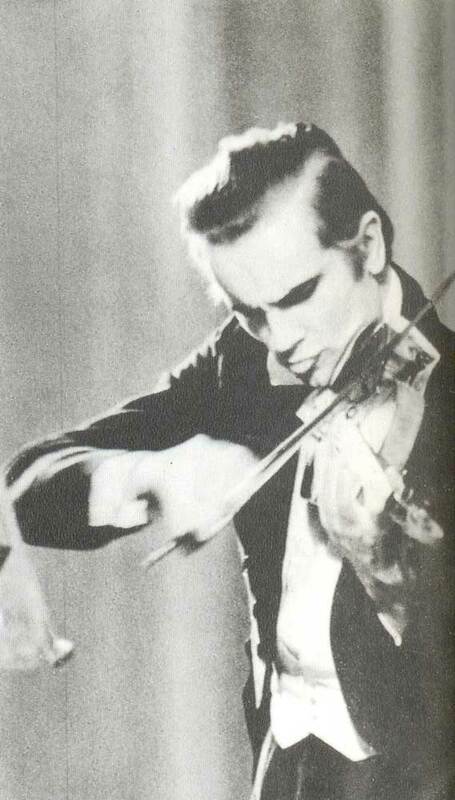 Asatur Grigoryevich Grigoryan, violinist. Teacher chamber ensemble and quartet playing (since 1945, since 1963 – professor). 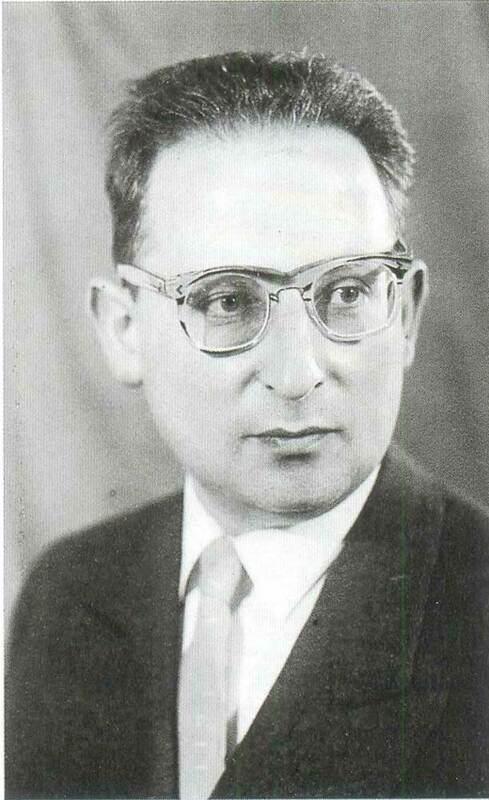 Yakov Ilich Rabinovich (1900-1980), violinist. Taught violin (1929-1960, since 1935 – professor). Yuri Isaievich Yankelevich (1909-1973), violinist. 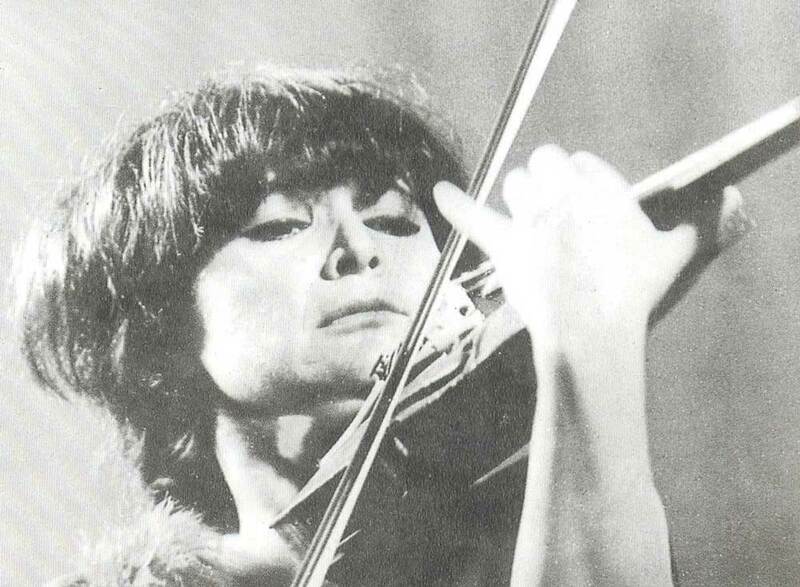 Teacher of violin (1936-1942, 1944-1973, since 1961 – professor). A.I. 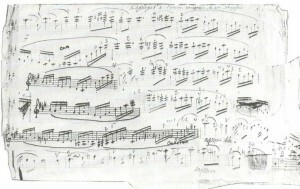 Kogachaturyan`s musical letter to L.B. Kogan. Leonid Borisovich Kogan (1901-0983), violinist. Teacher of violin (1952-1983 – professor). People`s Artist of the USSR, Laureate of the Lenin and State Prizes. A.I. 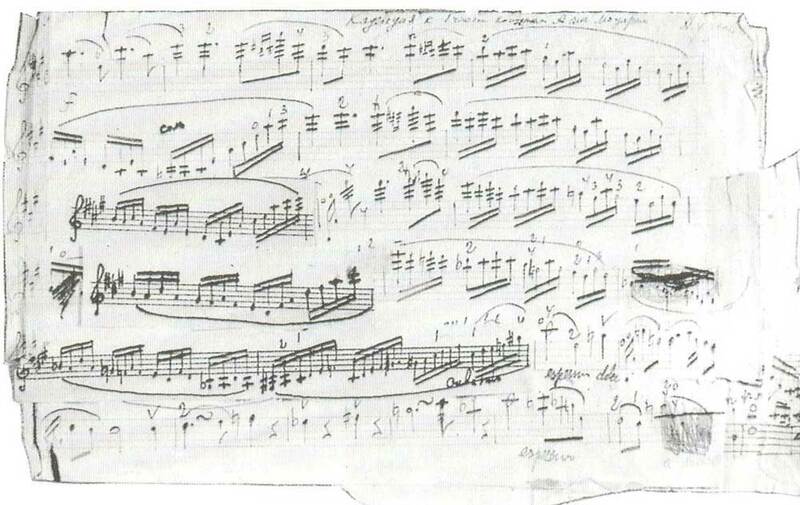 Yampolsky, Cadenza to the first moment of Mozart`s Solo Violin Concerto in A Major, Autograph. 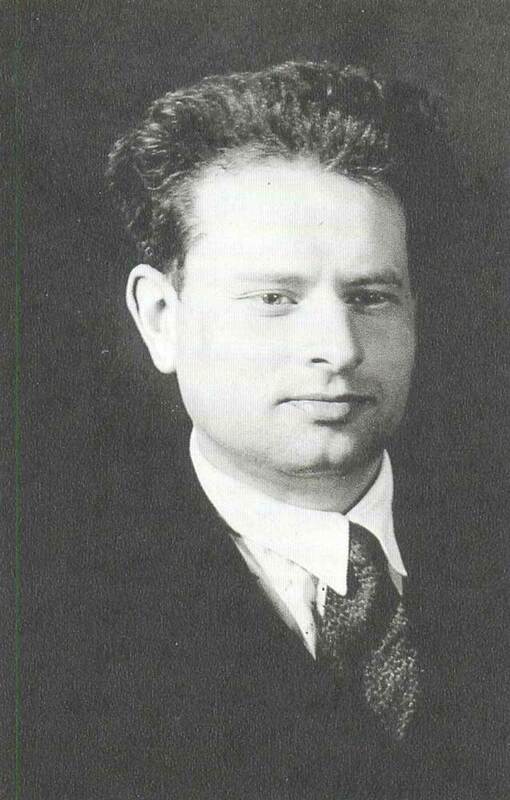 Abram Ilich Yampolsky (1890-1965), violinist. Teacher of violin (1922-1956, since 1926 – professor). Meried Art Worker of the RSFSR. 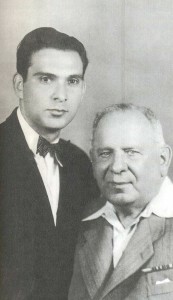 With his pupil Yulian Grigoryevich Sitkovetsky (1925-1958), winner of international competitions. 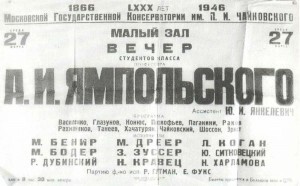 Poster announcing a concert of A.I. Yampolsky`s pupils (1946). Xelena Alexandorovna Erdeli (1878-1971), harpist, composer, music figure. 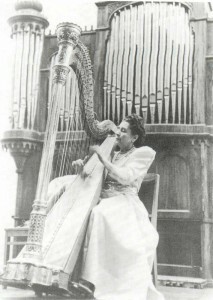 Teacher of harp (1905-1907, 1918-1971, since 1939-professor). People`s Artist of the RSFSR. 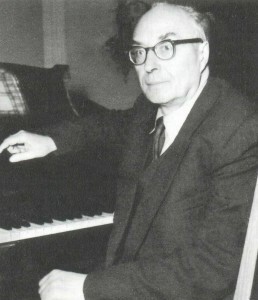 Leonid Isaakovich Rozman (1916-1989), organist, pianist. Teacher of piano and organ (1942-1989, since 1963 – professor). Merited Art Worker of the RSFSR. 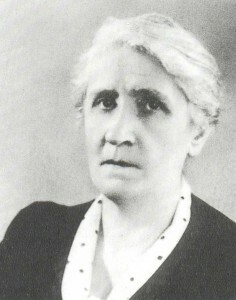 Marina Victorovna Mdivani, pupil of E.G. 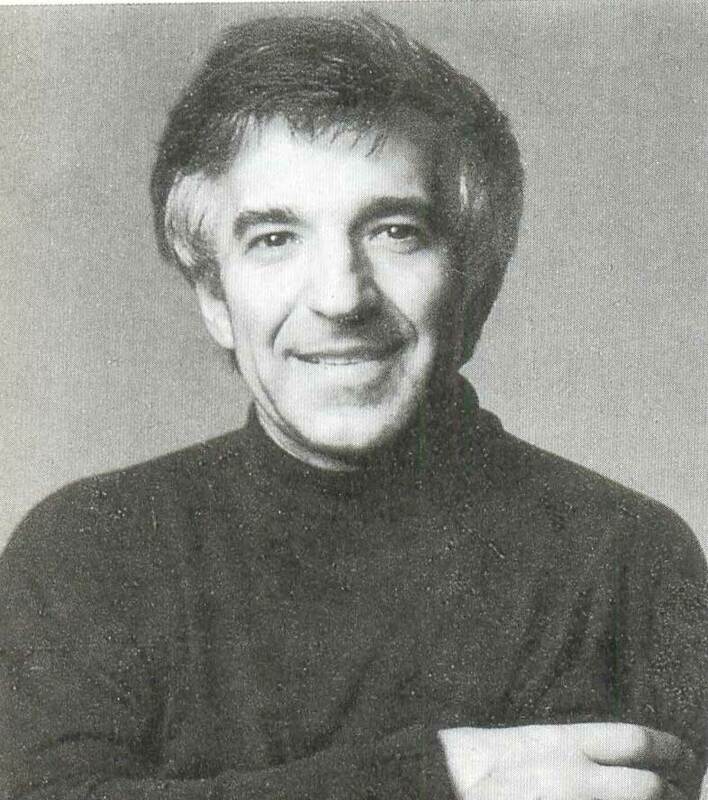 Gilers, Laureate of international competitions. 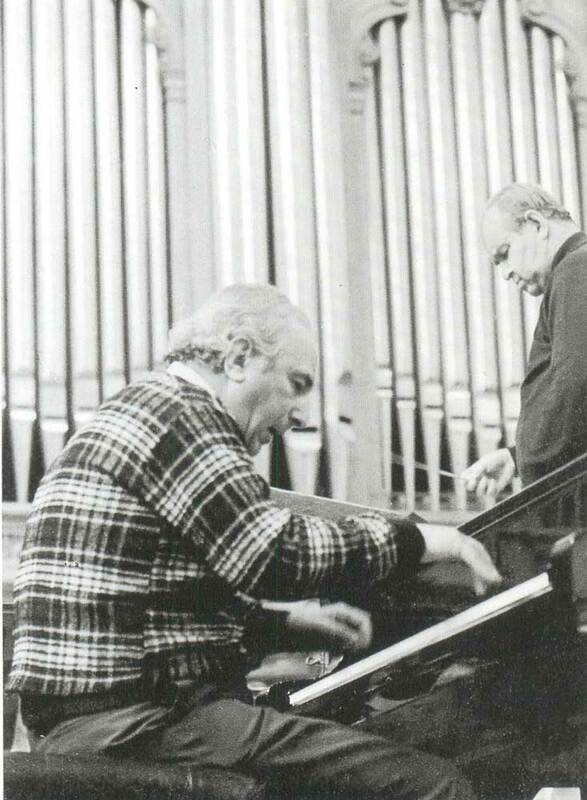 Emil Grigoryevich Gilels (1916-1985), pianist. 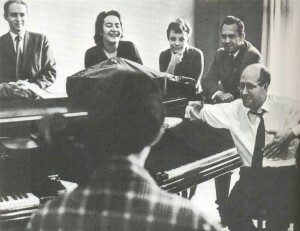 Teacher of piano (1938-1970), since 1952 – professor). People`s Artist of the USSR, Hero of Socialist Labour, Laureate of the Lenin and State Prizes. Ya. V. Fliere and D. F. Oistrakh during a rehearsal for the concert in the Grand Hall of the Conservatoire. 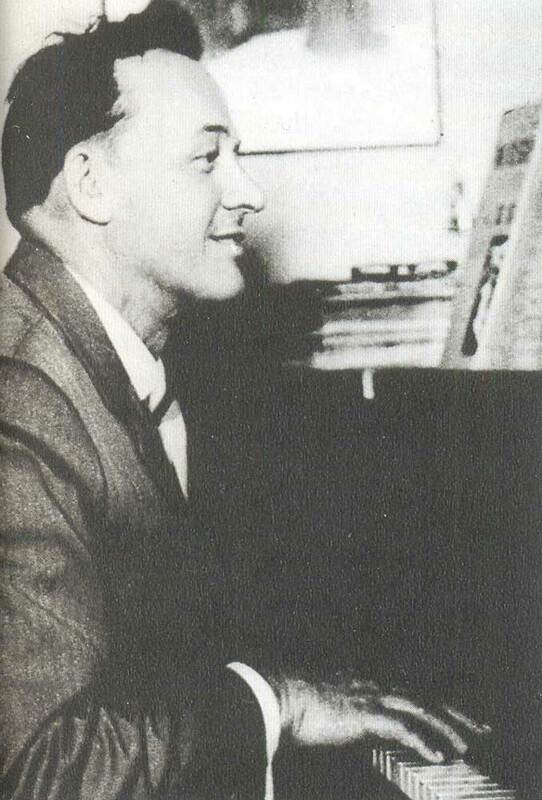 Yakov Vladimirovich Flier (1912-1977), pianist. 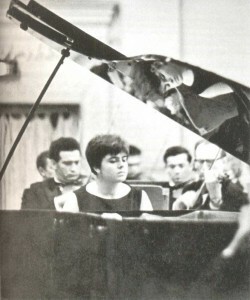 Teacher of piano (1937-1975, since 1947 – professor). Peopl`s Artist of the USSR. At the lesson in the class-room. 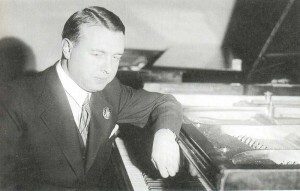 Grigory Romanovich Ginzburg (1904-1961), pianist. Teacher of piano (1928-1959, since 1935-professor). Merited Art Worker of the USSR, Laureate of the USSR State Prize. Together with his pupils. Sitting are: S.L. Dorensky, G.R Ginzburg, A.G. Skavronsky. Standing are: L.D. Digris, A.M. Spivak, Yu. I. Kogan, T.V. Syrtseva, V.A. Pikul, I.A. Arseyev (1958). Alexnder Alexandrovich Nickolaev (1903-1980), pianist. Teacher of history and theory of piano playing (1937-1974, since 1948 – professor and head of Chair of History and Theory of Piano Playing. Dean of Department in 1940-1942, 1951-1954, prorector for scientific work in 1954-1973, since 1974 – consulting professor). Vladimir Davidovich Ashkenasi, pupil of L.N. 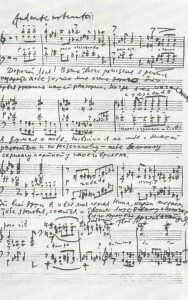 Oborin, Laureate of international competition. Lev Nickolayevich Oborin (1907-1974), pianist. 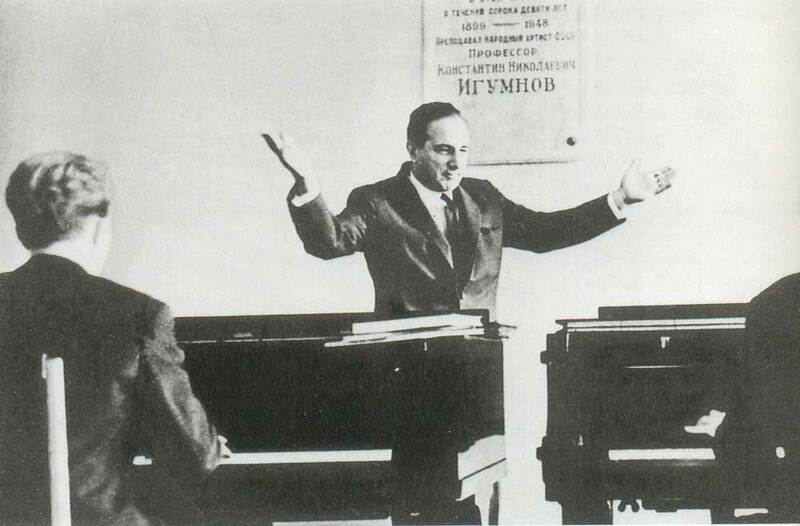 Teacher of piano (1930-1974, since 1935-professor). People`s Artist of the USSR.